Welcome to our new Frozen theme party prop hire section. Here you will find a range of frozen themed party ideas & decorations that will make for a spectacular party. From icy entranceways, fountains or sleighs to twinkly trees or white Chesterfield furniture, our frozen themed party decorations & props will truly create that Frozen look for your guests to enjoy. Host one of THE best frozen themed parties this year with Event Prop Hire. 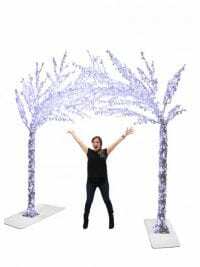 LED Crystal Tree Archway for hire. This beautiful LED Crystal Archway will look stunning as an entranceway at your themed party or event. 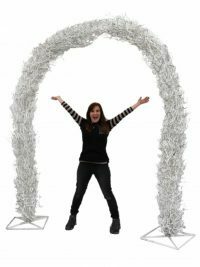 Suitable for all manner of themes including Narnia, Winter Wonderland and Fairytale, our LED Crystal Archway will really set the scene. The entranceway consists of two intertwined artificial twig trees adorned with hundreds of LED crystals to create this dazzling effect that will truly welcome your guests in style! Please note that this prop is quite heavy and comes in a number of sections. It requires several people to put this together and will take 1-2 hours. If you wish to discuss Event Prop Hire installing the item for you, please speak to a member of the sales team. This giant igloo is a fantastic replica of a traditional Inuit igloo and has been hand crafted by our very talented sculpting team. 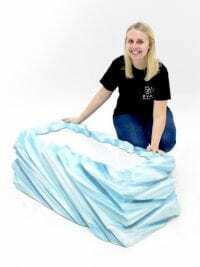 With its traditional ice blue colour and its sheer scale it will look amazing at your Winter, Ice or Frozen themed event or party. Ice Effect Poseur Table for hire. We're delighted to be able to offer this stunning hand crafted ice effect poseur table for hire; part of our new Ice styled collection. This poseur table would look fantastic in any Frozen, Winter Wonderland or Christmas themed event or party. And take a look below at the other items available from this range; grouped together they look fantastic and help to create a wonderful icy, frozen setting. Please note that the price quoted is for one poseur table only – all other items shown are available to hire separately. Ice Effect High Stool for hire. We're delighted to be able to offer this stunning hand crafted ice effect high stool for hire; part of our new Ice styled collection. This stool would look fantastic in any Frozen, Winter Wonderland or Christmas themed event or party. Please note that the price quoted is for one stool only – all other items shown are available to hire separately. Low Ice Effect High Stool for hire. We're delighted to be able to offer this stunning hand crafted ice effect low stool for hire; part of our new Ice styled collection. This stool would look fantastic in any Frozen, Winter Wonderland or Christmas themed event or party. Ice Effect Table for hire. We're delighted to be able to offer this stunning hand crafted ice effect table for hire; part of our new Ice styled collection. This table would look fantastic in any Frozen, Winter Wonderland or Christmas themed event or party. Please note that the price quoted is for one table only – all other items shown are available to hire separately. Ice Effect Coffee Table for hire. We're delighted to be able to offer this stunning hand crafted ice effect coffee table for hire; part of our Ice styled collection. This table would look fantastic in any Frozen, Winter Wonderland or Christmas themed event or party. White Winter Throne to hire. 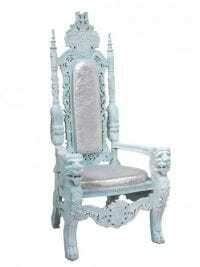 Sit back in style at your Winter, Narnia or Ice themed event with this beautiful ice white throne. Intricately designed, this throne would look amazing at your event or party. At Event Prop Hire we love taking tried and tested products and giving them an artistic tweak. 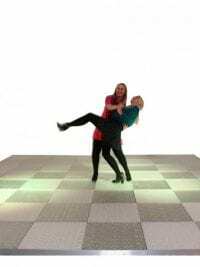 Here's a fine example of this…..for all of you out there fed up of seeing a standard black and white dance floor, why not consider this stunning ice effect dance floor for your themed event? Trust us when we say it really looks the part! Carved Ice Effect VIP Sign for hire. We're delighted to be able to offer this stunning hand crafted Ice Effect VIP Sign for hire; part of our new Ice styled collection. 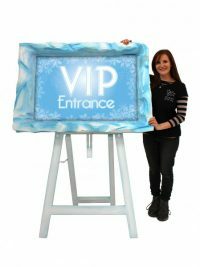 This VIP Sign (which comes with its own stand) would look fantastic in any Frozen, Winter Wonderland or Christmas themed event or party. We have in-house design and print facilities so if you would like this sign customizing for your event then please give us a call to discuss your requirements. White Twig Archway to hire. Take a look at this beautiful white twig archway for hire. 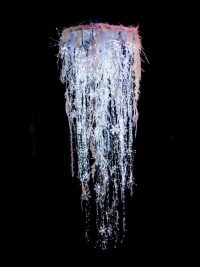 It would look stunning at any Winter Wonderland, Frozen or Christmas themed event or party. The archway comes resplendent with white LED lights and would create a fabulous welcoming entrance for your guests. Beautiful Illuminating White Twig Reindeer for hire. 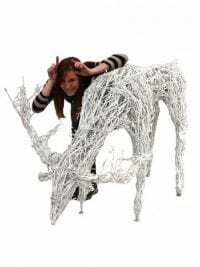 This freestanding Reindeer would be the perfect addition to any Winter Wonderland or Santa's Grotto themed event. 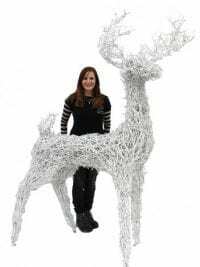 This freestanding Reindeer would be the perfect addition to any Winter Wonderland or Santa's Grotto themed event. This beautiful reindeer comes adorned with cool white lights. 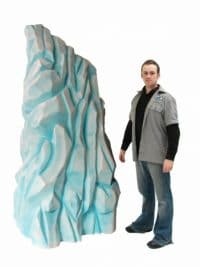 Take a look at this hand crafted ice boulder; perfect for any Frozen, Winter Wonderland or Christmas themed event or party. 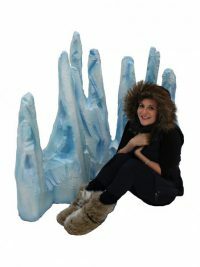 We've lots of ice themed props available to hire. Take a look below at some suggestions for other props that would complement the boulder perfectly to help create a wonderful icy, frozen setting. Please note that the price quoted is for one Ice Boulder only, the small boulder is available separately, measurements are a guide only and that sizes will vary as the boulders are hand carved and organic in shape. Please note that the price quoted is for one Ice Boulder only, the large boulder is available separately, measurements are a guide only and that sizes will vary as the boulders are hand carved and organic in shape. Ice Effect Stalagmites for hire. We're delighted to be able to offer this stunning hand crafted section of stalagmites for hire; part of our new Ice styled collection. These stalagmites would look fantastic in any Frozen, Winter Wonderland or Christmas themed event or party. 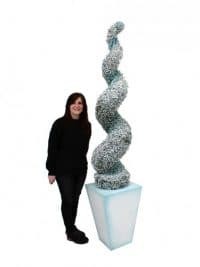 And take a look below at the other items available from this range, including a straight stalagmite section; grouped together they look fantastic and help to create a wonderful icy, frozen setting. 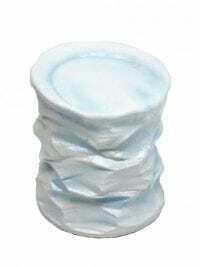 Please note that the price quoted is for one section of corner stalagmite only and the shape may vary – all other items shown are available to hire separately. 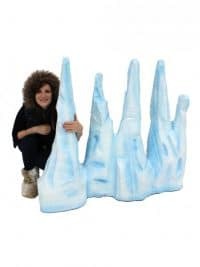 And take a look below at the other items available from this range, including a corner stalagmite section; grouped together they look fantastic and help to create a wonderful icy, frozen setting. Please note that the price quoted is for one section of straight stalagmite only and the shape may vary – all other items shown are available to hire separately. We're delighted to be able to offer this stunning lit stalagmite for hire; part of our Ice styled collection. These stalagmites would look fantastic in any Frozen, Winter Wonderland or Christmas themed event or party. Take a look below at some of our other icy items that are available. Please note that the rental price is for one small stalagmite. The large version pictured opposite is available to hire separately. This prop requires a standard 13amp socket. Please note that the rental price is for one large stalagmite. The small version pictured opposite is available to hire separately. This prop requires a standard 13amp socket. Ice Palace Entranceway prop to hire. 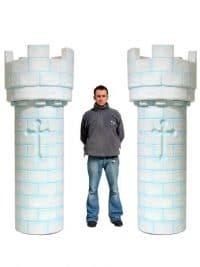 This fully 3d freestanding prop is perfect prop hire for any ice or winter wonderland themed event party night. 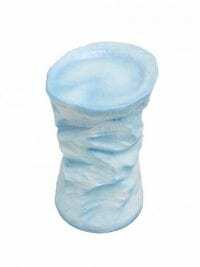 With detailed brick work, ice blue shading and a subtle blue glitter finish, this prop oozes class and would be perfect for your themed event. Available with functioning doors as an additional extra. Check our our matching ice statues, columns and snow cave entranceway! 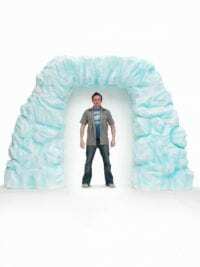 Ice Castle Entranceway to hire! 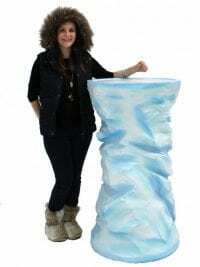 This fully 3d freestanding prop would be perfect for any winter themed event or party! With detailed brick work and fully working doors, this prop would be the perfect way to welcome guests to your event. Check out the rest of our winter wonderland themed props! Pair of Freestanding Towers finished in an ice white finish with subtle blue glitter hightlights. 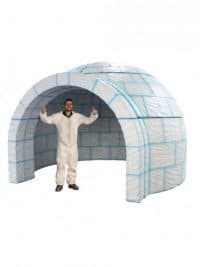 Perfect prop hire for any Winter Wonderland party or ice themed party event. This prop is freestanding and supplied as a pair as shown. 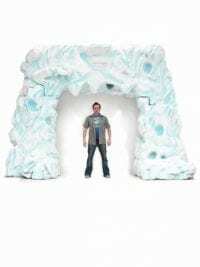 Ice Cave Entranceway prop to hire. 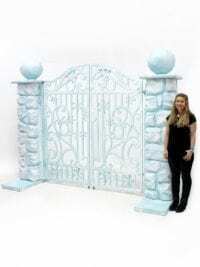 Finished in white with cool blue highlights, this entranceway is perfect hire for any winterwonderland or ice themed event party. Prop comes in 3 pieces and is incredibly large so please ensure you have the space for it! Ice cave entrance way to hire. This prop is perfect for any ice or winterwonderland themed event party. Prop is free standing and is assembled in 3 parts requiring no tools. As seen on BBC's Strictly Come Dancing Week 9, November 2010. Perfect for any Titanic themed event! "That iceberg showed more emotion" than Ann Widdecombe's dancing – Strictly Come Dancing Judge Craig Revel Horwood. Winter Snow Gates to hire. These beautiful gates are finished in white with subtle blue icy highlights. They have a snowflake detailing and are finished in a white glitter. 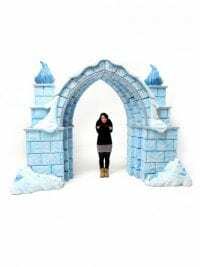 Perfect to hire as an entranceway for any Winter Wonderland or Alice in Winterland themed event or party! 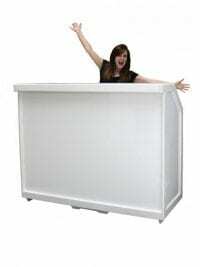 Snow effect edged Bar or DJ Booth to hire with illuminated panels finished in snowflake decals. Let your DJ spin his wheels of steel in fashion at your Winter Wonderland or Christmas themed event party. AT EPH we also have in-house print facilities so if you would like to customize the front of the bar with your image, logo or graphic then please give us a call to discuss. White Drinks Bar to hire. This is a stunning white acrylic bar that would be suitable for any winter styled theme. Please note that the prices given are for ONE section of bar only and that the sides, front and top of the bar will be delivered separately to the bar framework for you to assemble on site yourself. 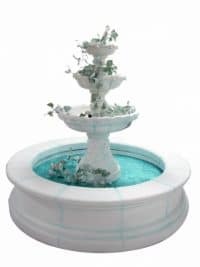 Working Fountain finished in white with cool blue highlights. 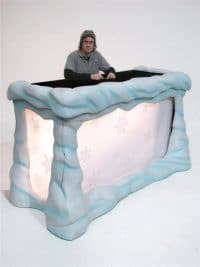 This prop is perfect prop hire for any Winter Wonderland themed event party. Please note, only the top 3 levels are used for water. The bottom is glittered in a baby blue finish. Ivy available as an optional extra – please ask for details. Santa’s Sleigh Prop to hire. 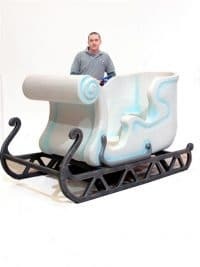 This white and ice blue sleigh is perfect for any Winter Wonderland themed event or party. This prop is fully 3D and has two fitted benches capable of seating up to two people. Check out the inspiration shot opposite for complementary theming using this prop (all further items are available to hire separately). Please note that all of our white sleighs are slightly different in design. 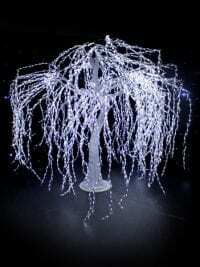 Ice White Topiary Tree Twist to hire. These topiary tree twists are finished in a cool ice blue and white finish with a subtle glitter sheen. 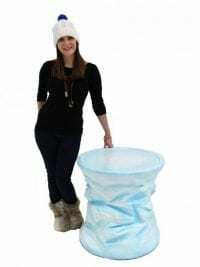 This an uber chic prop suitable for an upmarket Winter Wonderland themed event, ice theme or any other event where you require fabulous wintery scenery or dressing. The Twist comes presented in a classic white pot. 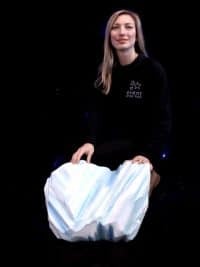 Female Ice Statue for hire. 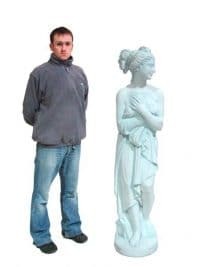 This is a freestanding classical male statue in subtle ice blue with a glitter finish and is the perfect prop to hire for any Ice or Winter Wonderland themed event or party. Please note that the actual design supplied may vary and that the columns pictured are available as an optional extra. Large Icy Outcrop to hire. 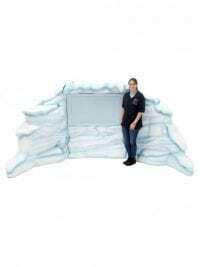 Fully 3D and curved, our large icy outcrop would be the perfect scenic prop to hire to help create an authentic winter outdoors scene for your event or party and would fit into loads of different themes. Lightweight in design, so easy to move around, the outcrop is finished with a cool ice effect. The flat central section (as pictured) is perfect for customisation; simply speak to one of the sales team for details. Alternatively, this central section is suitable for a TV to be inserted, but please note that this would be the responsibility of our client to arrange. We also offer a Customised Frozen Icy version of this outcrop. This prop consists of three sections that fit together to create the full icy outcrop. 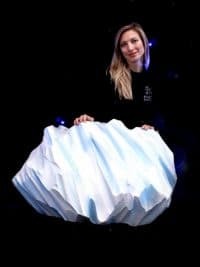 Lightweight, so easy to move about and position at your event, our large Iceberg Plinth will look fantastic at any Winter, Titanic or Ice themed event or party.